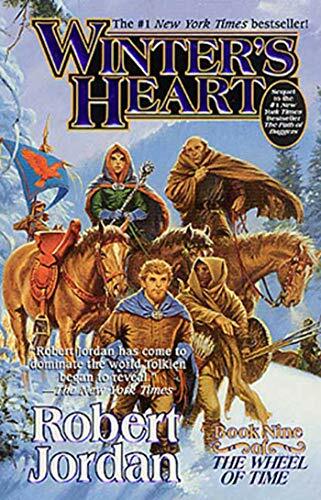 Robert Jordan is a writer active in the heroic fantasy field, and wrote a long series (as usual in this genre) called "The Wheel of Time". the flags seen on the books'covers are similar to the old roman vexilla, hanging from the horizontal bar of a complex pole arranged in a cross, except that they are tied to the vertical pole in the bottom, thus becoming similar in structure to a sail. They seem to be, however, heraldical devices, and apparently are used as family or clan symbols. The red flag with the black yin-yang symbol, I believe represents the Black Tower of the Ashaman. This is an organization of men who can "channel", doing magic using energy that springs from a central "Source". There are two halves to the Source, a male half and a female half, the names of which escape me, but the black half of the yin-yang is the Dragon's Fang, representative of males who can channel, and the white half is the Flame of Tar Valon, representative of the female half. Might I also note that the bannerman on the cover is flying the flag upside down! Unless I am greatly mistaken, the point of the black half is supposed to be down, and that of the white half up, so that the black half is a fang and the white half a flame. The ying-yang flag is symbolic of both male and female sources of the One Power. In the book only females known as Aes Sedai practice the one power openly in areas where they are accepted. Males who show signs of possessing use of the One Power are captuted and 'stilled' so they will not be able to use it. In other areas people are afraid of those using the One Power and will find various enemies in opposition to it. The female Aes Sedai use the white teadrop only as their symbol. The dragon symbol is used in the books as a decoration on chapter pages. A good rendition of the dragon appears <--! a href="http://elwood.pionet.net/~pcarrier/"> here [link broken]as well as another cover with a flag, this one blue with an eagle in flight on it. The dragon banner is precisely that: The Dragon Banner. It is the emblem of Rand al'Thor, the Dragon Reborn. He is, of course, the striking chap on the black horse carrying the sword in the cover image on your website, not to mention the main character of the books. Finally, I can identify the other flag mentioned - The blue field with the eagle in flight. That flag belongs to Manetheren, a once-powerful empire of the fictional world in which these books take place. The banner has recently been taken up by the Band of the Red Hand, along with their own ensign, which I cannot recall at this time. The dragon flag is symbolic of the Dragon Reborn, a person of prophecy who is to fight Shaitan and his forces in the last battle. He is a male who can use the One Power. In the ancient history of the book there were both male and female Aes Sedai but when the last Dragon defeated Shaitan, it made the whole male side of the One Power tainted. Lewis Theron the Dragon then went crazy and killed his family and all close to him, what followed was also the Breaking of the World. The Dragon Reborn is Rand Al'Thor who lives currently in the series.